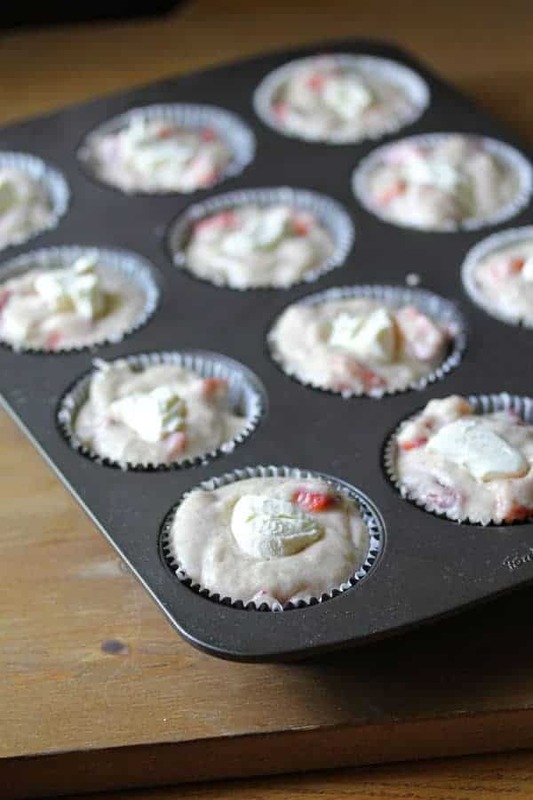 These muffins are packed with fresh strawberries and are hiding a delicious cream cheese surprise! Gah…I am obsessed with fruit these days. I have been channeling my obsession by putting fruit into everything. Smoothies, coffee cake, happy hour cocktails, even salsa. You’ll see. There are many fruity posts to come. I hope you are on board with this addiction. Together, we can will get through it. This one fruity idea was stuck in my head like a really great song. 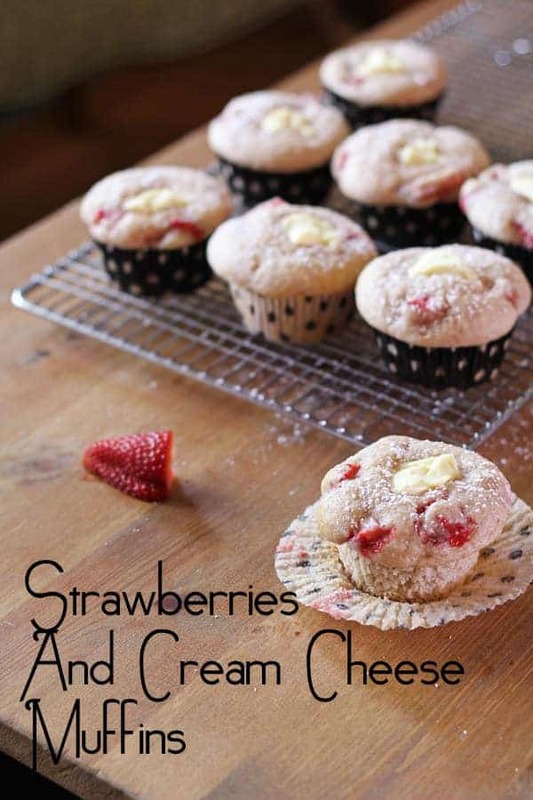 Strawberries and brie muffins. Over and over. The only way to get it out of my head, logically, was to make them. Alas, pregnant ladies are not supposed to eat unpasteurized cheese. So, this idea was re calibrated…and cream cheese makes a really great substitute. Anyway, the best thing about strawberries in baking is that you can use those ugly, over-ripe ones that get forgotten in the bottom of the plastic container after you’ve devoured the bright, pretty ones. Because it doesn’t matter what they look like, they all end up the same: soft, sweet, beautiful! Close your eyes. 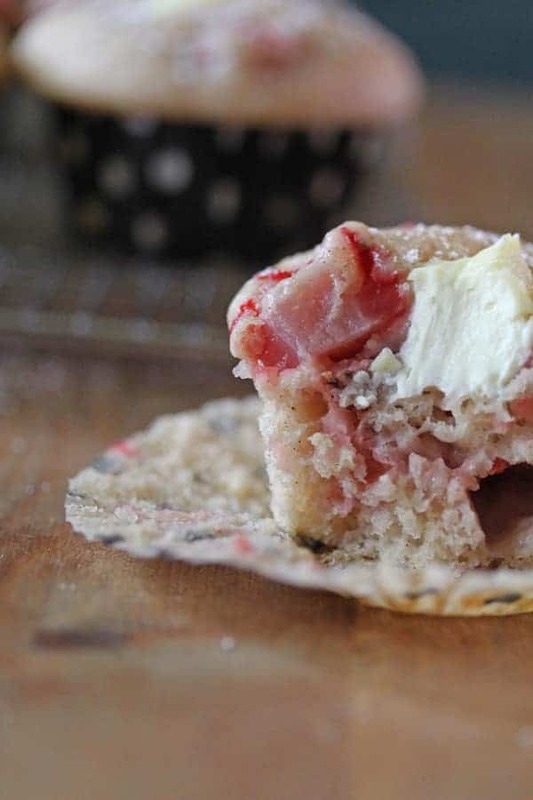 Imagine biting into a moist, fluffy muffin with a burst of strawberry flavor, a hint of cinnamonny richness, and a tangy, smooth cream cheese finish. Wait. Maybe don’t close your eyes. It’s hard to read with your eyes closed. It’s equally difficult to eat with your eyes when they are closed. These muffins are not super sweet. Therefore, in my eyes, they still qualify for the ‘muffin’ category. I’m not a huge fan of ‘muffin’ recipes that contain chocolate, or are covered with sugary streusel. Let’s call those what they really are: cupcakes. For me, muffins are supposed to be mildly sweet, and are all about that light, fluffy texture. These muffins check both of those boxes. I had one teeny tiny problem with them: waiting long enough for them to cool so that I didn’t burn my tongue on the scalding strawberries and cream cheese! In a large bowl, combine flour, baking powder, salt, cinnamon and sugar. In a separate bowl, beat egg lightly, and mix with milk and oil. Form a well in the dry ingredients, and add the wet ingredients into the well. Mix with a spoon until just combined. Mix in the strawberries. 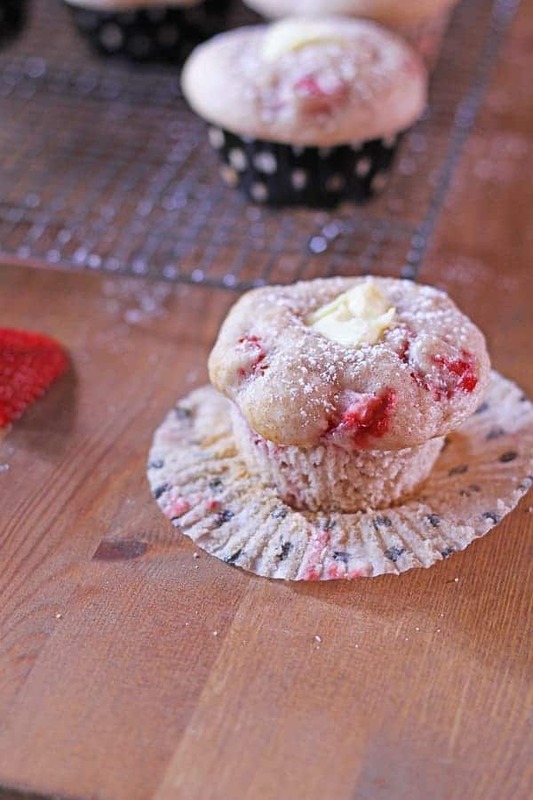 Spoon muffin batter into muffin tray containing large muffin papers. Fill ¾ of the way. 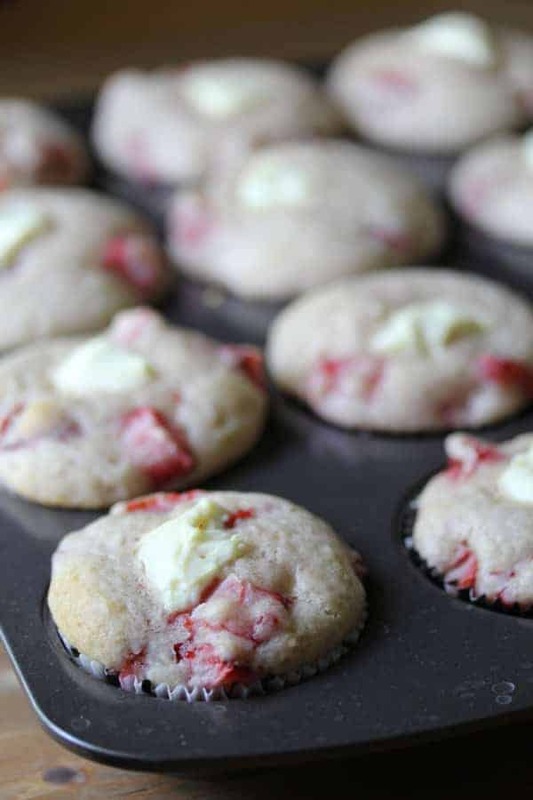 Add approximately one teaspoon of cream cheese on the top of each muffin, pressing so that it lies level with the top of the batter. Bake for 20-25 minutes, until a toothpick comes out cleanly. Made these this morning and was pleased. 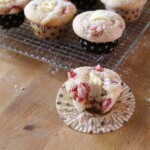 I love that they are muffins rather than cupcakes and don’t have all the extra sugar. The cook time seemed a little long, but that could just be my oven. I ended up with 19 muffins from the recipe. These should be stored in the fridge, yes? Thanks for the recipe. I will make these again! Ok, good to know! I think I ended up only using like 1.5 cups of strawberries since my 2 year old sous-chef kept eating them, but that still seemed to work out ok. I ended up giving them about 18 minutes in the oven, just for reference sake. I’m going to have to keep an eye on this blog now– thanks again and have a great week! I just made these and they are great! 20 minutes was perfect. I was worried the strawberries might sink but they didn’t. Mine only made 9 large muffins. They won’t last long :).